Sha-Lai Williams Woodson got conflicting advice from members of her dissertation committee when she was finishing up her PhD. One said that her paper would never be published unless she compared her research among African American communities with white populations. Another told her everybody does that, so she should compare findings among different African American communities if she wanted her work to stand out. Woodson, an assistant professor of social work at the University of Missouri–St. 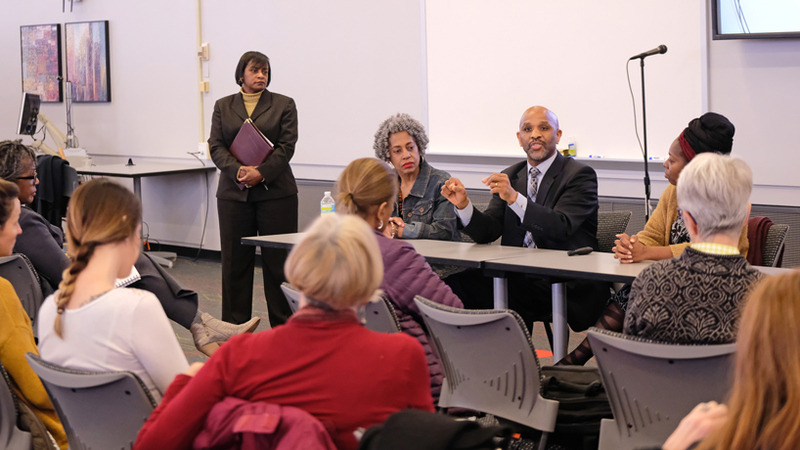 Louis, explained that give and take that resides at the heart of most research centered on African American communities during a panel discussion last Thursday at the ED Collabitat. Woodson, Associate Professor of Nursing Wilma Calvert and E. Desmond Lee Endowed Professor of Urban Education Jerome Morris presented summaries of their research and engaged in a Q&A session with around 40 attendees during the event, which was titled “A Conversation on Reframing Health, Education and Family in the Black Community.” UMSL Black Faculty/Staff Association and the Black Graduate Student Association presented the discussion. The aim of the program was to celebrate Black History Month by showcasing some of the innovative work being done by African American researchers at UMSL. Calvert and Woodson presented research into how community structures shape physical and mental health outcomes for African Americans. Calvert, in particular, delved into what effect fathers’ well-being had on raising their children, while Woodson examined how informal support structures such as churches can be influential in directing people toward getting professional help. Both hit upon the concept of “resiliency,” which is often perceived as a positive attribute in black communities but can turn out to be a net negative. Calvert said that while, in the past, churches have leaned heavily on prayer to help congregants get through difficulties, these institutions are now supplementing that solution with other resources. The Behavioral Health Network of Greater St. Louis is even holding trainings for church leaders centered on mental health services in the communities toward which they can point people seeking help. “The stigma associated in the black church with going to mental health services seems to be going away, and there’s no shame in saying you have an issue and talking to the pastor,” Calvert said. Morris’ research deals heavily with the “ecological” effects on education in predominantly black communities – how the surrounding area and conditions affect achievement and expectations of upward mobility among African American students. He also, in response to a question, was quick to point out the ever-present effects that racism and segregation have on the black experience in America. For instance, the Southern black culture is seen as the predominant form in the United States because, as African Americans moved to different parts of the country during the Great Migration in the 20th century, they were segregated into their own neighborhoods and retained the trappings of the South. Morris explained that recent African immigrants have learned to retain their culture rather than assimilate into mainstream black culture in America if they want a better chance at upward mobility. “In a traditional assimilationist model with European immigrants to the United States, over time, we see that they became American because they were able to participate in the broader society,” Morris said. “But we have not seen that (with black communities) because of entrenched racism and segregation in the United States. The panel discussion served as part of UMSL’s Black History Month programming, along with another panel event that night in the Millennium Student Center called “Black in St. Louis – Remembering Our Past,” presented by the UMSL African American Alumni Chapter, UMSL Alumni Association and the Associated Black Collegians. Morris said he hoped that the event highlighting UMSL researchers served as a launching-off point for the BFSA as well as a forum for promoting the work of black faculty members.